<photo title="Shorebirds at Pillar Point" id="3313428913" secret="2cd3cb44cb"
<photo title="Battle of the sky" id="3313713993" secret="3f7f51500f"
When calling this API method please ensure that your code uses the lastupdate and interval attributes to determine when to request new photos. lastupdate is a Unix timestamp indicating when the list of photos was generated and interval is the number of seconds to wait before polling the Flickr API again. The second call (flickr.panda.getList) tells you which of the Mystical Flickr Pandas are around to request photos from. Ling Ling and Hsing Hsing both return photos they are currently interested in, both have slightly different tastes in photos depending on their mood. The (currently) third Panda Wang Wang returns photos that have recently been geotagged, not quite realtime but close. Important! No-one fully understands the whims and fancies of the Pandas at any moment in time, these APIs give you a direct dump of what they are looking at (filtered for safe and public photos only) at this very moment. We cannot promise that this will not include ladies (or men) in bikinis, or possibly even ladies not in bikinis. You should keep this in mind while planning for your target audience, I’ll touch on this a little bit more in the Implementation Hints section. We’re always toying around with different ways to find and surface “interesting” photos. One method that people are generally familiar with is the Explore page, of which there’s always a lot of discussion. A good starting place for more Explore information is here with more general discussion in the Secrets Of Explore group. But behind Explore is an amount of “Secret Sauce” a lot of which focuses on activity around a media object. The Explore page is generally a daily experience, although things often pop in and out during the day. What we are doing with the Pandas is exposing a more real time experience, letting them each focus on various aspects of that activity, the first two Ling Ling and Hsing Hsing are fairly introspective and have different views of Flickr, but both focus on what they’ve noticed going on recently. The third Wang Wang is more a panda of the world and concentrates solely on geotagging. If you wanted to show photos being geotagged nearly as they happen, Wang Wang is the way to go. From a numbers point of view, Explore shows 500 photos from the last 7 days … a Panda can get through around 150,000 photos per day. A couple of caveats; Just because a Panda notices a photo, doesn’t mean that photo will make it into Explore, or even be destined to be considered by the Magic Donkey for Explore. Conversely, because a photo has made it into Explore doesn’t necessarily mean that a Panda will have noticed it. Also, because of the complexity and amount of stuff going on, no-one really knows exactly what Ling Ling and Hsing Hsing will find interesting, but that won’t stop us from tweaking the underlining code now and then. Also, you may have noticed that this is one of the less serious APIs, it’s both experimental and there to hopefully encourage fun and play. Please respect the Pandas and don’t abuse them, help us protect this endangered species and keep them alive. 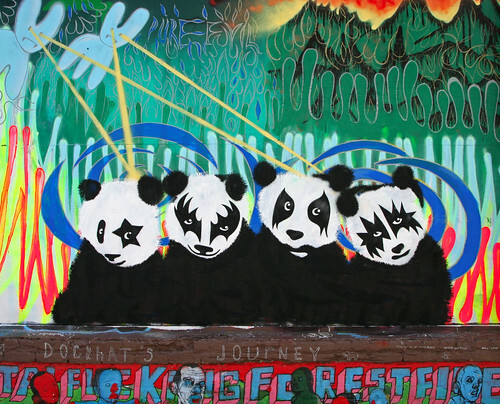 So, why are we doing all this messing around with “Pandas”? Well, mainly because we want to give developers another stream of photos with which to play with. For example you could build your own Flickr Zeitgeist Badge or slideshow or tool to just show stuff that’s going on over at Flickr. 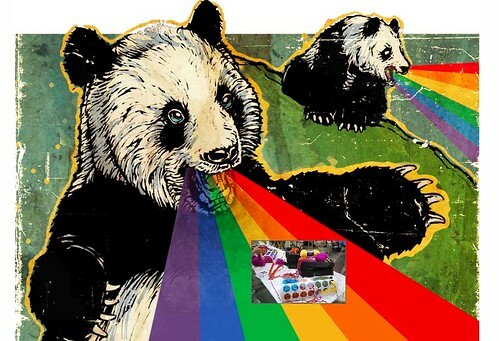 … (many people wished we hadn’t) … the Rainbow Vomiting Panda of Awesomeness as an experiment (which used Ling Ling fwiw). Since then we’ve been tweaking the backend, and now finally released the API so you can all have a go. It’s a stream of, on average, more interesting photos then you’d generally get from polling Everyone’s photos. The quality is pretty good, the best thing to do is watch The Panda for a while and figure out if a) you want to build something with a live stream of photos b) you can build something more better than a vomiting panda (which lets face it, it pretty hard to top!). When you get a packet of photos back from a panda, its around 60 seconds worth of stuff that the Panda found interesting. The packet is sorted by what the Panda found most interesting in that timeframe to least. Because people can often find ladies in bikinis interesting (for some reason) there can sometimes be some activity around ladies in bikinis that the Pandas may pick-up on. However, Pandas tend not to find ladies in bikinis that interesting (which may have something to do with why they’re in such peril) and when those photos appear they tend to happen in lower half of the packet of photos. So in the case of the Vomiting Panda above, I just threw away the second half of each packet, rather than go through all of the photos before asking for the next packet. I found this to be a good thing to do anyway, even though there’s always a lot of amazing stuff going on on Flickr the tail end of some packet wasn’t always quite as amazing as I wanted. You may want to do things differently, but that’s just what I found while working with the APIs. Anyway, on that note, at some point I’ll try to do a round up of stuff people have built on these APIs. If you want to post what you build to the Flickr Hacks group and/or FlickrMail me I’ll start to build up a list and take it from there. Photos by ohad* and psd.